Dome Connect is the Estate & Facilities Management tool to effectively manage your built Asset. 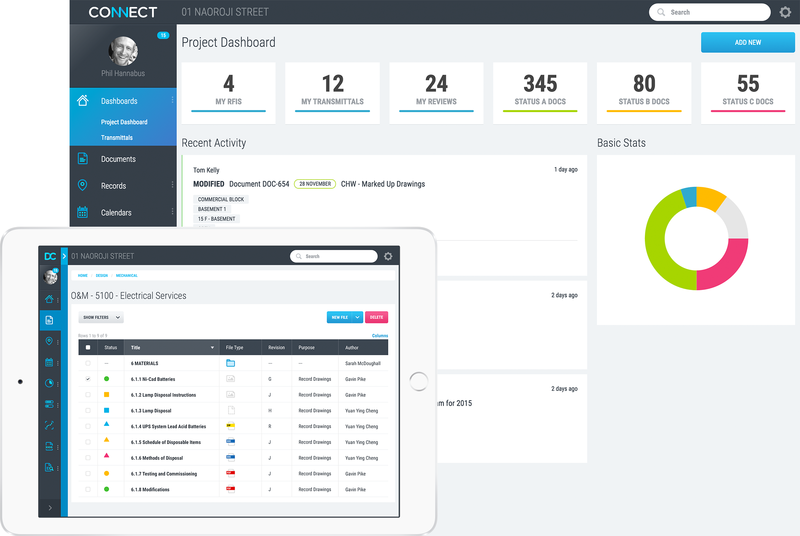 Connect's flexible architecture allows you to integrate seamlessly with third-party Asset, Project Portfolio Management and Building Management systems. The software enables you to instantly access your record drawings, operation & maintenance information, specifications, commissioning test data and manufacturers literature. With Connect you can upload all of your historic building information to harness superior search capability and create a single, easy-to-manage information repository for your portfolio of assets. Dome Connect forewarns the project management team of non-compliant contractors through the means of transparent progress reporting that's always live against programme. Automated progress reporting & performance monitoring. Mobile application for snagging & defect management puts you in control. Dome Connect's digital online delivery eliminates printing and distribution costs. Dome Connects rigorous, multi-tier review process ensures the best quality of information is delivered to the Estate Management team at hand over. Dome Connect Gravity is a web application used for the collation, approval, and delivery of critical Design / Legal / O&M / Commissioning / Asset and FM-related information. Dome Connect bridges the gap between the design, construction and occupation of a building. During construction, Dome Connect is the documentation project management tool for the timely delivery of quality building information. Dome Connect's best-of-breed, full-text search capability means you'll always find exactly the information you need. Our search engine indexes all documents on-the-fly so there's no need for arduous manual meta-data entry. No human interpretation of progress or status as reports are fully automated within Dome Connect. Pie Chart executive summary reports. Detailed package-by-package progress. Integrate the network programme to drive project milestones and O&M delivery. Embed the existing construction or commissioning programme then analyse critical path and produce S-curve progress reports against baseline. Simple traffic light status for the executive management. Detailed, programme-driven status for the project team. Dome Connect is a secure, web-based project collaboration tool used within the construction and property portfolio industries. The Dome Connect software is used industry-wide by End-Clients, Developers, Project Managers, Main Contractors, Construction Managers, Trade Contractors, Design Consultants, Building Managers and FM Teams. Management & collation of O&M Manuals, H&S Files, As-built records, etc. By engaging Dome and using its Dome Connect software we have full transparency at all times of the commissioning process and this is often the most accurate barometer of actual completion. The electronic storage of O&M manuals means that they can be readily accessed by tenants and building management teams and assist in the smooth operation of the assets.